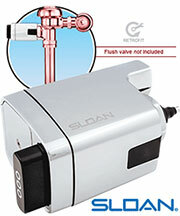 New holder allows you to place or hide it almost anywhere. 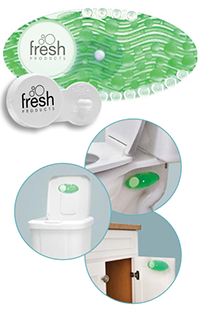 Freshens while remaining hidden on the side of toilets, inside bathroom cabinets, the underside of trash can lids, and so much more. The holder stays in place with two sided tape, and the Curve is replaced each month. Unique date tabs allow you to choose when to replace it, so now you'll get consistent air freshening. Each pack of 10 includes 2 holders. 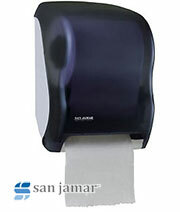 This powerful air freshener works well in ladies restrooms, lobbies, conference rooms, nursing stations, offices, kitchens, bathrooms, and more. It contains 50-100x more fragrance than a standard toilet rimstick and consistently releases pleasant fragrance over the course of 30 days. The Curve comes with a plastic holder that sticks to any flat surface and doesn't need to be replaced once it's installed. An easy reminder system lets you know when to replace the air freshener; simply remove the tabs upon installation to set your replacement date. Item CURV10-CM: I love this scent it smells so fresh and clean. I also love this product the scent seems to last a long time. 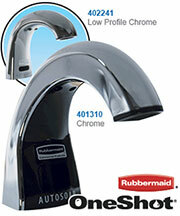 Item CURV10-CM: It makes the bathroom smells great.